RainChute EZ®: The RainChute EZ® is an above-ground gutter downspout extension that directs water from your gutters away from your home quickly and easily. If your home has landscaping near the foundation, this is the best option, as no disruption of your gardens or foliage is necessary. 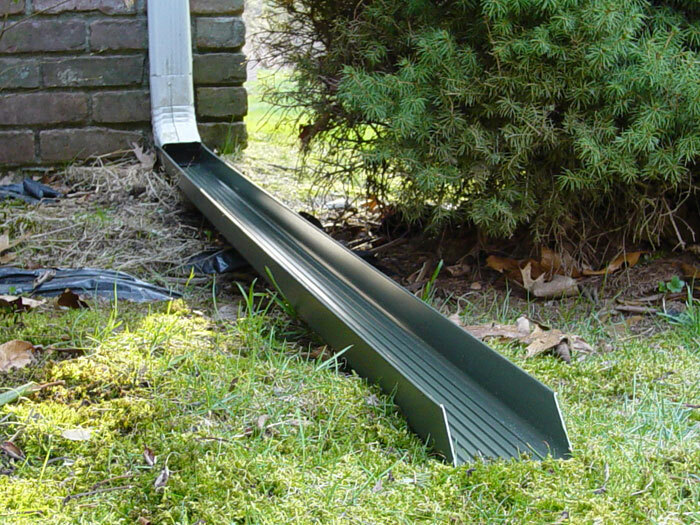 RainChute®: The RainChute® is a recessed gutter downspout extension. 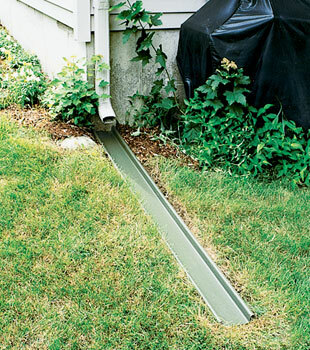 Like the EZ, it's designed to redirect water from gutters away from your home. This design is ideal for lawn use, as the mower can pass right over the system without incident. 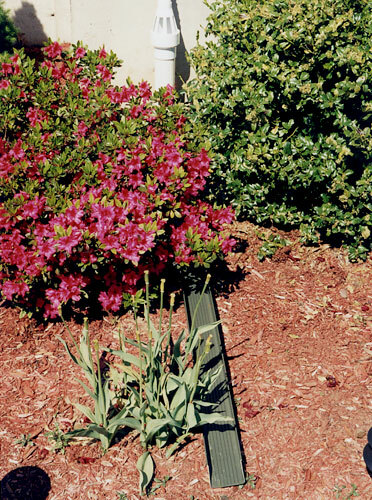 Our gutter downspout extensions add beauty and functionality to your home's drainage system! With one quick add-on, you can keep hundreds of gallons away from your foundation each time it rains. To learn more about how we can transform your basement into dry, usable space, call or e-mail us today for a free basement waterproofing quote! Our Certified Waterproofing Specialists serve throughout Canada, the United States, and the United Kingdom. 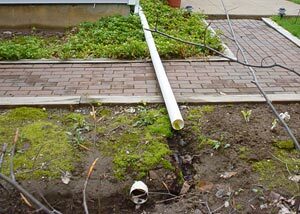 If you've extended your downspouts on the lawn without burying them, you've got an ugly eyesore in your yard. 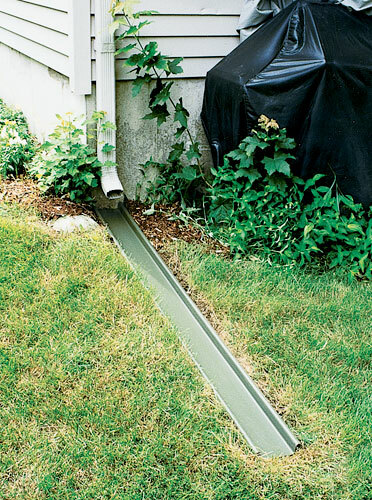 Downspout lines that are aboveground in a lawn are an annoyance for lawn mowers and a major tripping hazard! It's been calculated than a one-inch rainfall deposits about 500 gallons of water on an average-sized roof. If all that water is running down your gutters and into the ground around your foundation, you're adding a major burden to your waterproofing system! 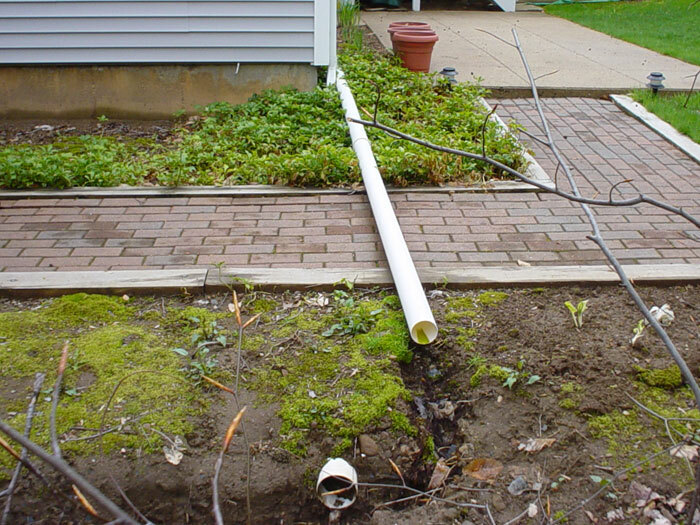 By extending your downspouts past the ground directly around your foundation, you can send it down the grade and away from your sump pump. Talking the load of your sump pump will allow it to work less for the same results -- and last longer! The RainChute® is made from tough material! You can count on it to hold strong under foot, and you can run directly over it with your lawn mower. The recessed design of this system looks great along with your lawn and landscaping, and it eliminates an otherwise serious tripping hazard. Both RainChute® Systems are self-flushing, minimizing the need for maintenance and cleaning. Enhance Your Landscaping For A Drier Basement! 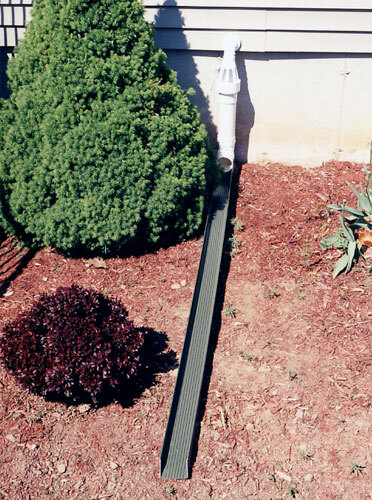 Our LawnScape™ Systems -- along with our other outdoor drainage products -- provide simple, common-sense solutions for your home that really make a difference! You'll love how your home looks once they've been installed. For more information about our more than 30 patented waterproofing products and how they can help you, contact us today! We can connect you with your local, Certified Basement Dealer who can provide you with a free basement waterproofing quote! 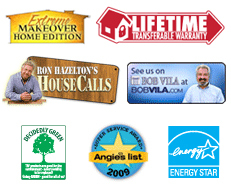 Our dealers provide their free quotes to homeowners at no cost or obligation. Each quote includes an on-site inspection and measurement from one of our specialists. We'll also provide a free, professional consultation, advising you on your problem and answering any questions you may have. Before our visit, we'll also mail along a complimentary copy of our free basement waterproofing book. This full-color book is packed with information about basement waterproofing, including which products and services we provide. Contact us today to get started!